A long time ago, in a comic book series far, far away, there were some wonderful little stories that were unbounded by corporate overlords. Back then there wasn’t the gigantic mutant Lucasfilm licensing machine keeping a watchful eye on what was being done with valuable intellectual properties. Creativity was unfettered. Really, back in the 80’s, Star Wars fandom was relegated to the toys and the comics. Anything else was tangential at best. 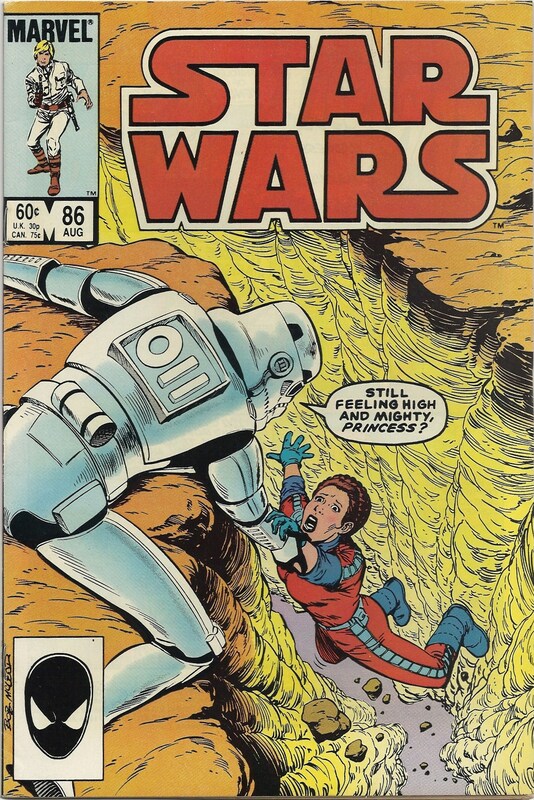 And I can remember when the comic series came to an end with issue #107, Star Wars came to an end in a lot of ways. There was nothing left. Not until books started to be published in the early 90’s did the franchise revive and eventually bless us with a horribly turgid new trilogy of films. But back in the halcyon early days, we were gifted with some deft out-there tales. Now relegated to the dustbin of “not-in-continuity,” these comics often included concepts that were later overwritten by the movies. These stories were coming out as the original trilogy films were released, and stuff like “I am your father” often threw things for a loop, but the creative teams always regrouped and offered up more helpings of satisfying material. 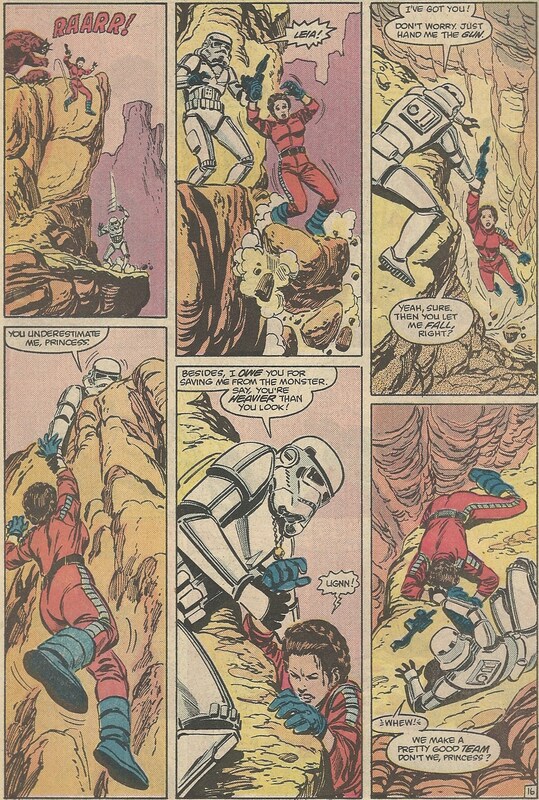 The old Carmine Infantino run was a wacky treat, but I came along later in the game, so a lot of the stories I read came out after The Return of the Jedi put a bow on the cinematic offerings. 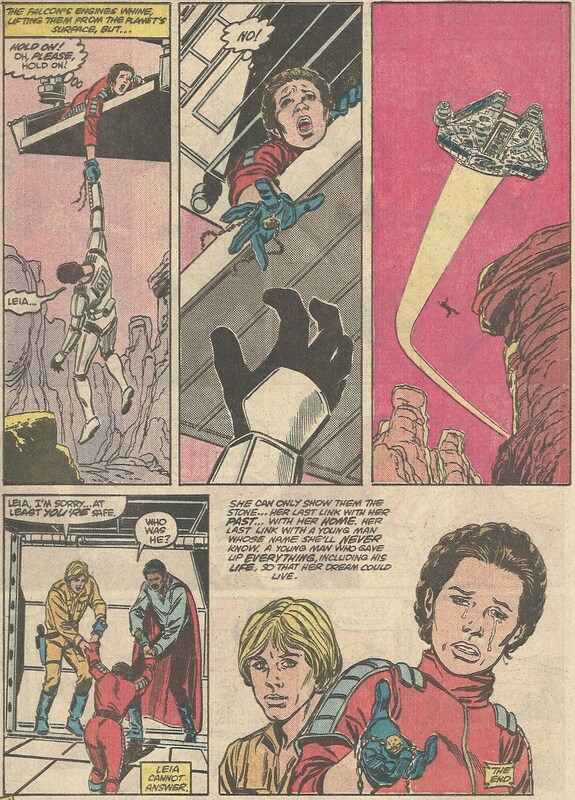 I always thought of these stories as “real,” that is, that they were what truly happened to Luke, Leia, Han and the gang after that whiz-bang shindig on Endor. Then those dreadful prequels came along and crapped all over certain concepts. Thanks, George. I liked this story a lot as a kid and it still has a good deal of resonance. The redemption of the Stormtrooper (an “uknown soldier” in some ways) echoes the redemption theme that was at the heart of the original trilogy. It’s the best of Star Wars, the type of stuff that makes you proud to be a fan of those old adventures. I suppose all those new books and cartoons and comics have rendered moot a lot of the post-Jedi Marvel run, but I like to think that this one st0ry remains untouched. And that’s all that matters. Who cares that Lucas started (or stopped) taking potent medication and ruined his own creation? It only becomes germane if you find yourself in a big prize Star Wars trivia contest. Otherwise, enjoy what REALLY happened a long time ago and a galaxy far, far away. Thank you for this review. The new teaser trailer that was released today reminds me of this story. The redemption of a Stormtrooper can explain the conflict in a new way.